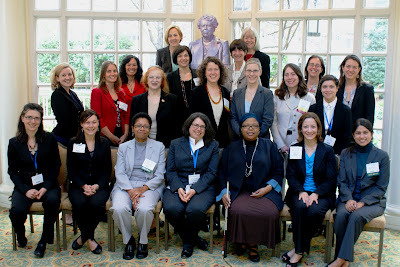 This time last year, IntLawGrrls gathered at the statue of Eleanor Roosevelt to have our photo made 'round ER, one of the 1st of our transnational foremothers, during the course of the annual meeting of the American Society of International Law. Bottom row, from left, Alexandra Huneeus, Kathleen A. Doty, Karen Bravo, Kathy Roberts, Hope Lewis, Elizabeth Trujillo, Saira Mohamed. Middle row, from left, Christie Edwards, Elizabeth B. Ludwin King, Kristine A. Huskey, Caitlyn Antrim, Cymie Payne, Deena Sharuk, Hari M. Osofsky, Elizabeth Andersen, Amy Senier, Shana Tabak. Top row, from left, Diane Marie Amann, Chiara Giorgetti, Eleanor Roosevelt, Lucy Reed, Stephanie Farrior.